This year marks the 20th Anniversary of Magic the Gathering. It’s grown from a back room, kitchen table card game to an international success. In Magic’s history, heroes were born and died, legends came and went, but through it all the game endured. No longer is the game solely an American one. It has spread overseas into dozens of countries and has been translated into more than a dozen languages. In the last World Magic Cup, more than 70 countries participated, and each country seems to have their own unique way of doing things. Traditions, game play, card choices and strategies . . . over the years each country has made Magic their own game. It goes without saying that no two players from different countries are alike, and that their environment plays a huge part in shaping who they become as a player and how they play. A few weeks ago I wrote an article entitled “The Japan Metagame Diaries: (not) The Last Cardboard Samurai“, and I talked about what it was like to learn how to play competitive Magic in Japan. I focused on the lessons I’ve learned such as community, flexibility, and consistency, eventually coming to the conclusion/hypothesis that Japanese players are known for their talent because they are a product of their environments. They grew up playing a certain way and that’s why they play that way now. When you’re used to playing a certain way in your own shop or own state, it can be hard to adapt to the new gameplay and rules set up by the shop you’re visiting. Japanese players are known for their unique ways of shuffling or habits with cards when playing a match, and none are better known in and out of Japan than Tomoharu Saito. I was lucky enough to meet him at the Chiba Pro Tour Qualifier on August 10th in Chiba City (about an hour outside of Tokyo), where he went 6-0-1 and made the top 8 at the event before losing in the first round of single elimination. We talked about the recent birth of his son, the current metagame, as well as what we’ve been up recently. He was very personable and granted me an interview the following day after M14 Gameday at his store Hareruya near Takadanobaba station in Tokyo. Back in early July, I wrote another article titled “The Road” and about how difficult it is for Japanese players to go pro in Japan. It’s my intention with these “The Japan Metagame Diaries” articles to help open the world of Magic the Gathering in Japan to those players that will never be able to speak Japanese, as well as those Japanese players who do not speak English but would like to share their thoughts with the international Magic community. In doing so, I hope to improve communication between Japan and the rest of the world, share their ideas and way of thinking, and to bring prestige to the country in the form of more professional players and events. It’s about 4 pm at the store Hareruya in Tokyo. M14 Game Day is over and I’m 2-3 on the day. I was playing for fun, using my newly brewed Esper reanimator deck. I lost to GW aggro, Jund control, and Esper flash (I beat Esper control and Naya Humans). The previous day I had attended the Chiba Pro Tour Qualifier and attained the points I needed for a team bye at GP Kyoto, and two byes at GP Kitakyushu. 28 players showed up to the event, which was a decent turnout for a Game Day in my opinion. I’m looking through the insanely large amount of Japanese and English foil Magic cards when Saito-san comes into the store. We talk a little about the PTQ from the previous day and he tells me about a new build he worked on overnight with some of his staff. The store has multiple tournaments every day, and he’ll be testing the new build later that night. 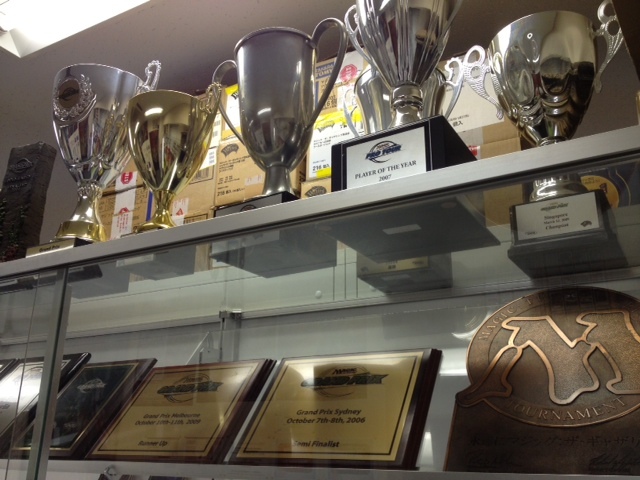 With the store still busy from Game Day, we walk into Saito’s “office”, which is just a corner behind the counter. For those of you that don’t know who Tomoharu Saito is, (I’m guessing if you don’t follow Magic news and haven’t been a player for long, you wouldn’t know), let me fill you in. Tomoharu Saito is a 30 year old Magic player from Tokyo, Japan. He’s been playing Magic the Gathering for more than 13 years, has won a Pro Tour, 4 Grand Prix’s, and numerous other awards such as Player of the Year in 2007. His accomplishments are many and he’s made many contributions to the game of Magic over the years (for more information, visit the Wikipedia page about him). The Japan Hobbyist: On the last Hall of Fame ballot, not a single Japanese player was selected. Why do you think that is? Tomoharu Saito: I think the reason that no Japanese players were selected this time is because Japanese players don’t have a lot of fans outside of Japan. There is very little international exposure concerning players and events in English. The only way for a Japanese player to get noticed is to continuously get good results at major Magic the Gathering events. TJH: I see. Well then, what can Japanese players do to improve their image in the world of Magic? Saito: Making more Pro Tour appearances and finishing highly in big events is great for exposure. I think Twitter is another way that pro/semi pro Japanese players here in Japan can get in touch with their followers/fans. By posting deck ideas and interacting with their followers, they can improve their image. TJH: In a somewhat related question, what’s your current opinion on the state of MTG in Japan? Saito: I don’t think that it has changed that much since I started playing. There are still a lot of strong players, and I think that’s mostly due to the card culture here in Japan. Kids in Japan start playing from a very young age, moving from game to game until eventually settling on Magic. TJH: Speaking of the card culture here in Japan, how did you learn to play? What were some difficulties you had as a beginner? Saito: It all started with video games. I used to always go to game centers (arcades) after school and play for hours with my friends. I would ask the older players for help when starting out and they would give me tips. It’s the same with Magic. I always talked with the strong players at big events to get their help and advice. TJH: If MTG is still around in 10 years, how will you go about teaching your children about it? Saito: I’m going to make learning Magic the Gathering as fun as possible for my kids. At first I will let them play around with cheap commons and throw them around for fun, and as they get older I can use the cards to help them learn to read difficult kanji characters and give them rewards for learning new vocabulary and how to write them. I want to make a good atmosphere for my kids so that they’ll follow in my footsteps when they are older. Including myself, my children will have all my friends in the Magic community here in Japan to help them become good players. TJH: You’ve done a lot for MTG in Japan over these last few years. You’ve opened a store, provided resources and online content for customers, as well as reached out to the international Magic community through your shop. However, is there still work that needs to be done? If so, what? TJH: Sounds exciting. I can’t wait to check it out. My next question has probably been asked many times already, but I have to ask it. As a professional player, what do you think it will take to finally be accepted back into the professional community without being judged by your past? Saito: There is nothing I can say or do to change anybody’s mind, and I’m fine with that. I’m just going to keep on enjoying Magic and win, win, win! 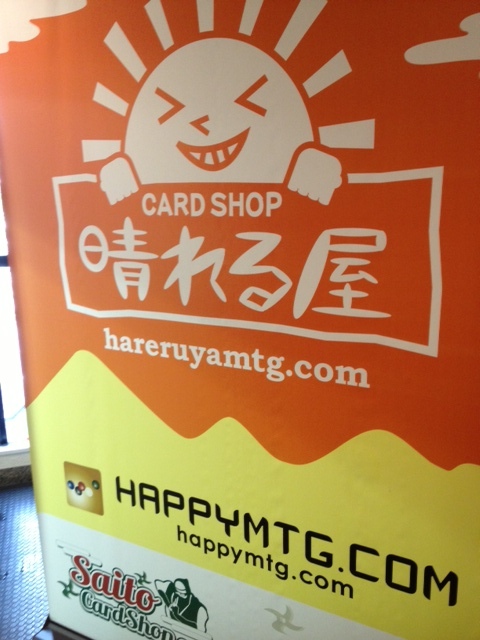 I’m playing Magic to have fun now and focusing on spreading it around Japan. TJH: How does Japanese culture affect how you build decks, make strategies, and play cards? Saito: A country’s culture might have affected players here in the past, but the internet has really changed how people play and build decks. You can’t really say somebody plays like a Japanese person or like an American, that’s just not the case anymore. What you have are strong players making strong decks, making the best choices, and playing well. If you look at other cultures, many players tend to put their deck tech on video services like Twitch TV and walk you through step by step on how to use such and such a deck. In Japan, there are no manuals. This could lead people to think that Japanese players are mysterious and to question why certain cards are in a deck while others are not. TJH: Having played against many people overseas, how do you compare yourself as a player? What differences do you see? 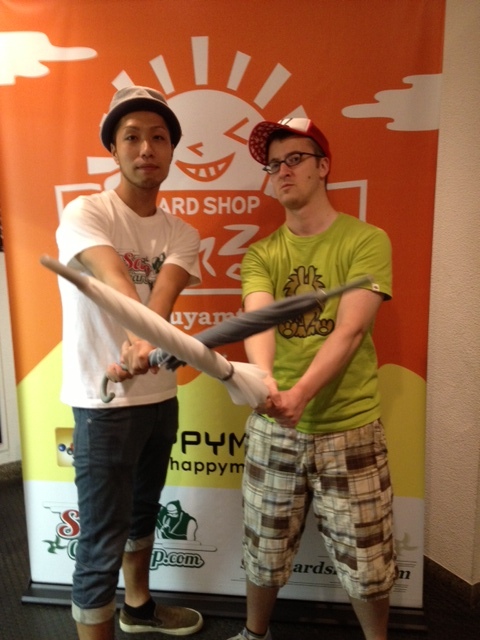 Saito: Compared to other players around the world, I think my deck making skills are some of the best. My drafting skills are also very strong, which goes hand in hand with good deck making skills. TJH: I want to thank you for your time. One last question. What is the biggest responsibility of MTG players (in Japan) when it comes to growing the game and introducing new players? Tomoharu Saito: The most important things to do for new players are giving good advice, teaching them the rules and answering their questions, giving new players tools to help them improve, and to show how much you can enjoy MTG. Making the game fun for everybody is incredibly important. That would be great, but what kind of questions would you like me to ask him? Sounds good to me, I’ll just reword the questions when I ask them and think of some new ones. Congratulations on the interview! It’s amazing you’re in the field getting the grit of Magic in Japan out there for viewers like us. I love this article. I tend to build decks around pro player answers to this question. My current card is Fog. It’s a bastardly cheap spell that keeps me alive for just one more turn. Do you plan on living in Japan? I plan on being in Japan for the next few years at least, so you can expect me to do more articles like this in the future. Glad you liked it. I think the current favorite card thing has been done before, but for GP Kitakyushu I have something fun planned to any pros that would like to help out. Shuhei Nakamura, Kenji Tsumura, and quite a few others will be there so I hope they let me interview them!